Susan Avery Stewart’s Winter’s Graces is a compelling, poignant, and necessary rebuttal to a culture that devalues people as they age. Dr. Stewart reveals the untapped resources of our human family through a framework rooted in science and ancient wisdom that helps us intentionally embrace the cycles of nature, and one another. 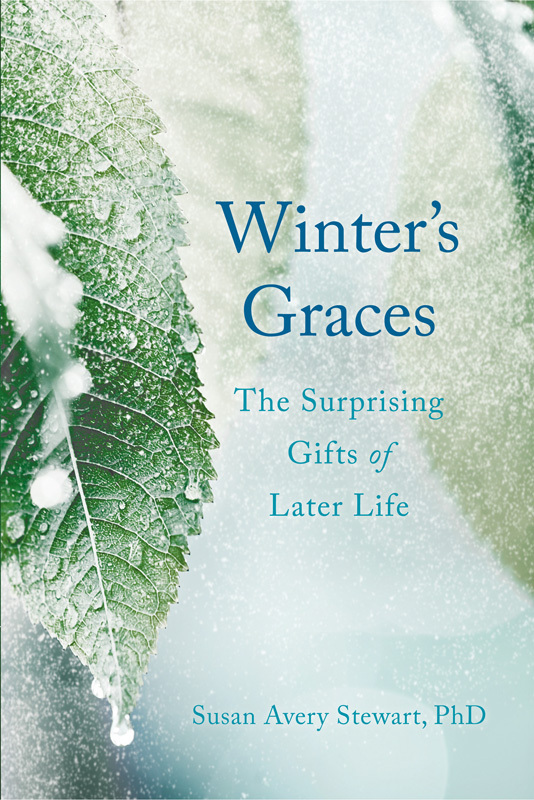 Dr. Stewart’s Winter’s Graces gives us all a persuasive and satisfying guidebook on aging, uniquely presented through a rich synthesis of personal story, solid research, and myths and legends spanning time and culture. This writing represents a clear voice characterized by the very same qualities it encourages for cultivating an attitude of agelessness: healthy defiance, optimism, and openness to change. Dr. Stewart invites us to question our collectively reinforced assumptions and face our fears about becoming older. We are reminded to invoke wisdom, compassion, humor . . . and a little necessary fierceness. Dr. Susan Stewart’s book is a gift to all of us who are making the transition to late adulthood. Written in a beautiful, moving, personal, and descriptive style, her work is inspiring, healing, and filled with timeless wisdom. Susan’s writing has reaffirmed that I am not alone with the challenges that I am facing in the second half of life, and has given me the courage and perspective to forge onward with a renewed optimism about life and all that it has to teach me. Dr. Susan Stewart has indeed followed her own instincts and inner wisdom in gathering stories that illustrate the meaning and value of our lives as we move toward adult maturation. She distills eleven qualities or ways of being – graces– that are possible in the third stage of life which correspond to the natural and organic season of winter. She has thoughtfully organized this gentle book in approachable steps that encourage reflection, imagination, and acceptance. At last – a glorious look at the gifts of aging! Winter’s Graces takes readers on a magnificent journey through the later years, in all their joy and fullness.